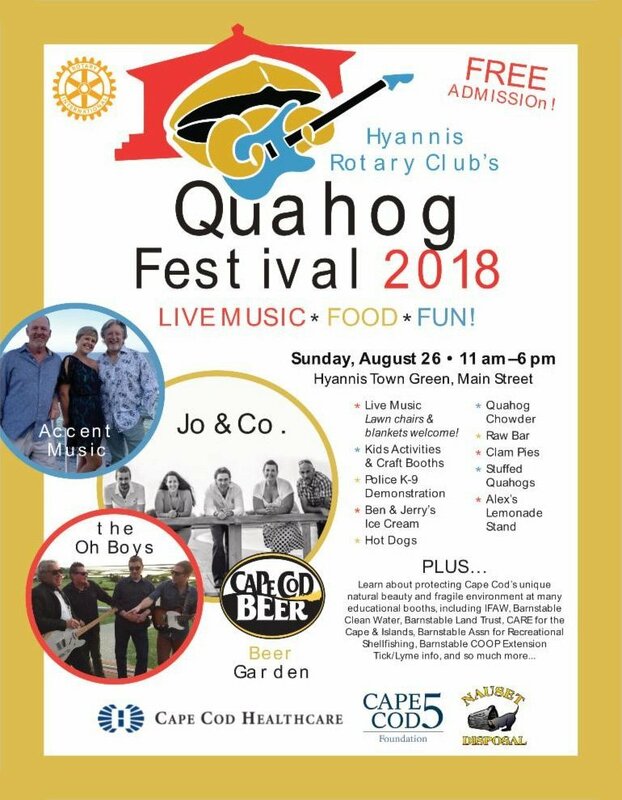 The Rotary Club of Hyannis is presenting its first Quahog Festival on Sunday August 26th from noon to 6:00 pm on the Hyannis Village Green. BARS will have a booth there selling its famous chowder and grilled cherry stones. Live music by Accent Cape Cod, Link Montana & the Oh Boys, Jo & Co.
Plus: Kids Activities, Craft Vendors, Food, Educational Displays. Learn about Cape Cod’s Environment and Natural Beauty. Barnstable Shellfish Constable, Barnstable Police K9 Dept. Demonstration and So Much More!